Just bought some vinyl wrap and started playing around with ideas for the bike. Here's what I've done so far. The cool thing is I have enough to redo the entire bike a couple of time. I'm thinking maybe a flame scheme next? Looks pretty good. 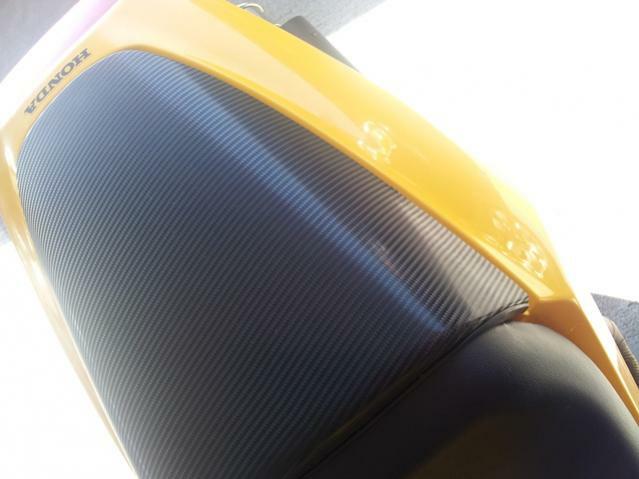 I really like the carbon wrap on the seat cowl. I was initially trying to cover the entire bike, but some of the complex curves were too difficult, so I just made sure I covered any of the scratches and dings that I've repaired. Not too bad for a first attempt. That is very cool. I always wondered how that stuff worked. Is it like shrink wrap? You heat it up to apply? Yeah, how do you buy the stuff and maybe a short description of how you applied it if you could. I got it from EyeconApparel. I did my exhaust cans in the carbon fiber and so far it's stayed on well. There's a small bubble around a couple of the rivets, but it looks better than it did. It has an adhesive backing, and can shrink or stretch with heat. 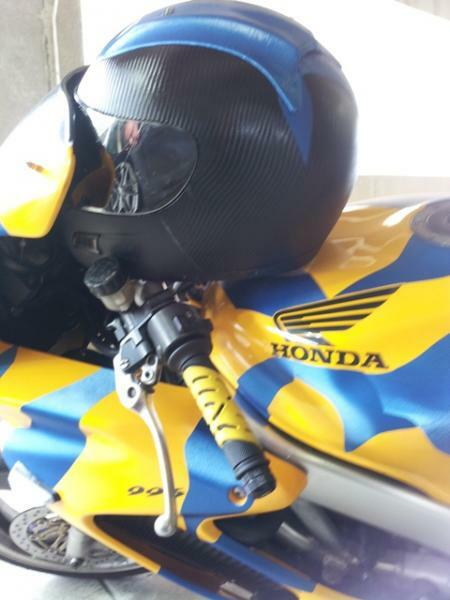 I wrapped my helmet in that carbon fiber too, took hours, but it didn't turn out too bad. I'm getting better with it, did a little different design on the left side of the tank. I'm going to try to wrap the whole tank soon, wish me luck. Thanks! How does the material look in person? I'd be really interested in seeing the exhaust wrapped! That looks so awesome. How much mater did you buy? Im guessing that the whole bike can be done in less than 20 feet if your good and use scraps to do smaller parts you could probs get away with 15 foot... right? I'll take pics of the exhaust tonight. It's not bad at all, that's after a few hundred miles of riding too. As far as the length of material, I bought a 5x10 piece of the carbon fiber and a 5x10 of the blue. I still have over half of that left. The best part is when I get tired of the design, I can change the whole thing up again. Dwade, you started with a yellow bike then cut strips of the blue? Is the bike too curved to do the whole thing? It's possible to do the whole thing. I had probably 3/4s of each peace done at some point and ran into an issue of too much vinyl bunched up in areas. I've gotten a lot better at doing it, so I'll attempt to do the whole bike again one day soon. 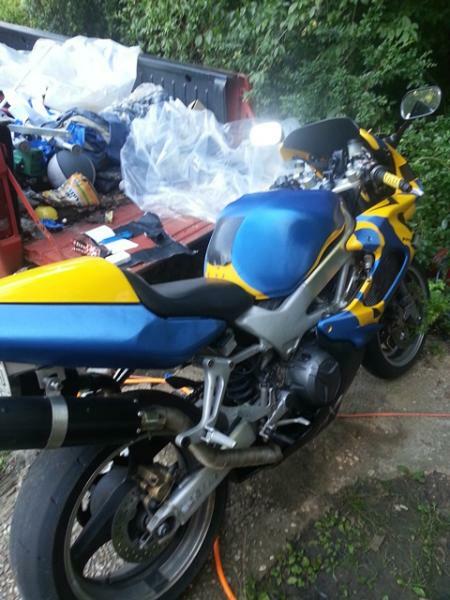 Yeah, the bike was yellow, then I took the vinyl and then just randomly came up with that design. I always wanted to do a bike entirely chrome. My brother owns a graphics and vinyl shop. This winter my Hawk will be dismantled and we're creating a DC vs Marvel wrap and probably powder coating the wheels. The carbon fiber I used was something new called 4d. I did the rear fairing and tank this weekend. Cut out a spot where they were going together, trying to do it all in one piece. I'll order some more in a couple of weeks and attempt the tank again. 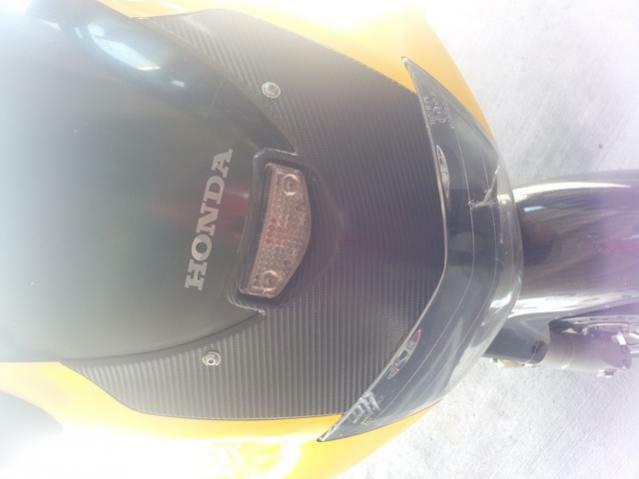 I'm putting a new tank pad on there, so I just placed a piece of the carbon fiber on the tank for fitting purposes. It looks a little better now than in this photo. Really? Now that should look sweet! Thanks, the blue does look really good. It has a brushed aluminum look to it.